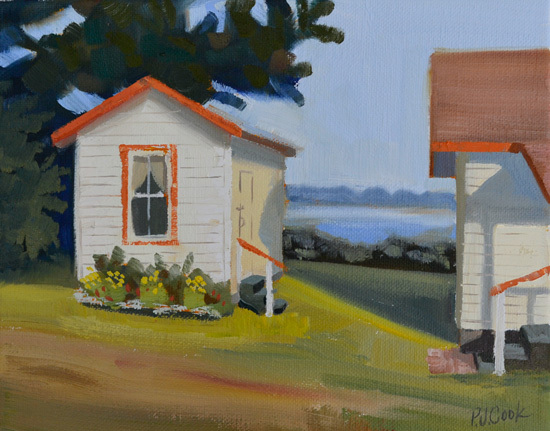 A Maine landscape painting is the theme for this latest original oil painting. “The Guest Cabin” sits on the shore and is a tiny one room overnight cabin. What struck me was how cute the cabin was with it’s bright orange trim and flowers across the front. I just had to paint the scene so I decided on a small “alla prima” oil painting done wet into wet style of painting. This painting was completed in one sitting. The biggest challenge painting wet into wet is keeping the colors bright. This painting is for sale on my website and can easily be shipped. It is sold unframed but a frame can be purchased in your choice of colors. NextCreating Textures in Watercolor – Guaranteed to Improve Your Paintings!